FamilyWize is a national community service program that is improving the health and financial stability of millions who are uninsured or underinsured. Our goal is to ensure that everyone has access to affordable prescription medications. Today, close to ½ of adults or 80 million people have no prescription coverage or inadequate coverage. Even after the affordable care act, more than 60 million Americans will still be uninsured or underinsured. And sadly 60% of uninsured Americans do not fill their prescriptions because they can’t afford them. FamilyWize, in partnership with United Way Worldwide and close to 1,000 United Ways across the country, have helped more than 7 million people save over 700 million dollars on the cost of their medications, often saving as much as 75%. Average savings are about 40%. FamilyWize is able to achieve significant discounts on prescriptions through creation of a large umbrella buying group. 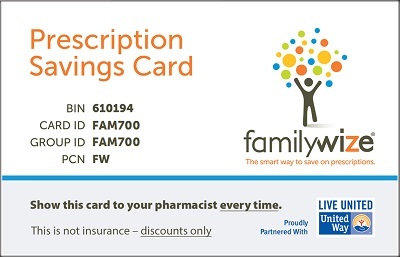 FamilyWize negotiates the lowest prescription prices possible with the pharmacies and passes 100% of the savings on to anyone who presents the FamilyWize card. The FamilyWize card covers all FDA-approved prescription medications, and is accepted at over 60,000 pharmacies across the country. The card is free and all funding for the program is provided by part of the dispensing fee that is included in the cost of medicines. FamilyWize provides tools and information to help support members including a Drug Price Look Up Tool and Pharmacy Finder along with valuable resources that can be found along with the FamilyWize Card at FamilyWize.org or on our new Mobile App. FamilyWize is making prescription medicine more affordable, offering relevant information and creating connections to unprecedented community support. FamilyWize is changing lives by giving everyone who needs help the strength to enjoy a better quality of life.